Fiber Optic Cable Products supplies fiber optic media converters converting signals from fiber to Ethernet. There are multiple configurations available including the Multimode and Singlemode versions operating at multiple wavelengths. Most are available with LC Duplex media converter ports or the SC, ST Fiber Optic Media Converter Ports. These are most commonly a 2 fiber version or a 1 fiber version media converter. 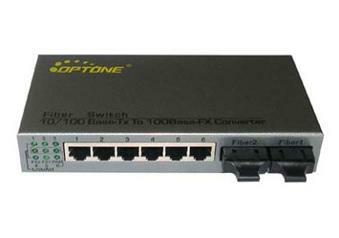 1/2 port 100Base-FX ,Single or multi mode. 10Base-T: 3, 4 or Cat 5 shielded / unshielded twisted pair, 100 meters max. 100 Base-TX: Cat 5 shielded / unshielded twisted pair, 100 meters max.